This is a guest post by CMA Devarajan Swaminathan. He has over 10 years post qualification experience in Accounting, Auditing, Finance as well as Management Accounting. He is the proprietor of Devarajan Swaminathan & Co - Cost Accountants. IFRS or The International Financial Reporting Standards are the accounting standard norms that Companies globally have started to adopt. India is committed to prepare its financial statement based on IFRS from 2011 onwards. An attempt is made here to understand the DNA of the Organization, namely the International Accounting Standards Committee Foundation or the IASC Foundation, which has taken on the responsibility to frame International Financial Reporting Standards and how India is represented in this structure (at least till now). In writing this article references have been heavily drawn from the IASB website www.iasb.org , IASC Foundation Constitution and the book IFRS Practical Implementation Guide and Workbook – 2nd Edition by Abbas Ali Mirza, Magnus Orrell, Graham .J. Holt, a John Wiley Publication. The International Accounting Standards Committee Foundation or the IASC Foundation is the parent body or the Organization. From 1973 untill 2001 the body in charge was the International Accounting Standards Committee (IASC). IASC was created in 1973 between the professional accountancy bodies in 9 countries and from the year 1982 its membership comprised of all the accountancy bodies who were members of the International Federation of Accountants (IFAC). The principle significance of the IASC was to encourage national accounting standard setters around the world to improve and harmonize national accounting standards. The members of the IASC who were Professional Accountancy Bodies of the world delegated the responsibility to the IASC Board. The IASC Board was responsible for all activities including standard setting activity. The Standards adopted by the IASC Board were known as the International Accounting Standards (IAS). The constitution of the International Accounting Standards Committee Foundation (IASC Foundation) was approved in its original form by the erstwhile International Accounting Standards Committee (IASC) in the year 2000 and by the members of the IASC at a meeting on 24th May 2000. The erstwhile IASC Board had appointed a nominating committee to appoint the first Trustees. In execution of its duties the first trustees formed the International Accounting Standards Committee Foundation on 6th February 2001. There is a key difference between the erstwhile IASC and the present IASC Foundation. The members of the IASC were the accounting bodies of the world who were also the members of the IFAC. The IASC Foundation does not have such a relationship with these global accounting bodies. The IASC Foundation is an independent not for profit private sector organization. Its Governance rests with its 22 Trustees. It receives funding in the form of donations from Organizations, Accounting firms, Central Banks and Capital Market Regulators amongst others. The funding of the IASC Foundation is based on four principles. In its Annual Report of 2007, the Foundation received funds of approximately 11.28 Million Sterling Pounds. 26 Countries contributed. Of these, 174,358 Sterling Pounds was India’s contribution. Contributors from India include the RBI, ICICI, Infosys, Grasim Industries, Bharti Airtel, Tata Sons, Satyam Computers, L&T and RIL. It is interesting to note that International Accounting Firms contributed 3.24 Million Sterling Pounds approximately 28% of the Total Funding received by the Foundation. Firms included PWC, Deloitte, E&Y, KPMG, Grant Thornton, BDO and Mazars. Although the governance of the IASC Foundations rests with the Trustees, the Monitoring Board plays a pivotal role as the crucial link between the Trustees and the Public Authorities that have generally overseen accounting standard setters. This link between the Trustees and the Monitoring Board is established by way of a Memorandum of Understanding (MoU). Such a MoU will be made available to the public. A draft of the MoU is available on www.iasb.org. The process of getting the MoU signed between the Trustees and the Monitoring Board is already in process. The monitoring board has the authority to participate in the process and the appointment of Trustees. It has the authority to overlook whether the trustees are discharging their duties in accordance with the constitution. The Trustees make an annual written report to the Monitoring Board. 1.A responsible member of the European Commission. 2.The Chair of the IOSCO Emerging Market Committee. India as is apparent is not represented on the Monitoring Board. The Trustees of the IASC Foundation are responsible for its Governance including funding. The Trustees are publically accountable to the Monitoring Board of the capital market authorities. According to the present trustee distribution, the Trustees comprise of 22 individuals. 6 Trustees have been appointed from the Asia Oceanic region, 6 Trustees have been appointed from North America, 8 Trustees have been appointed from Europe (although the constitution has provided only for 6 from Europe), 1 Trustee from Brazil and 1 Trustee from South Africa (although the constitution provides for 4 from other regions). India is represented by Mr. Mohandas Pai of Infosys. The Trustees are initially appointed for a period of three years. The trustees are, in addition to the governance of the foundation, responsible for the appointment of the members of the International Accounting Standards Board (IASB), the International Financial Reporting Interpretation Committee (IFRIC) and the Standards Advisory Council (SAC). They also have the power to terminate non performing members of the above board, committee and council. The IASB is responsible for all standard setting activities, including the development and adoption of IFRS. The IASB comprises of 14 members that is to be increased to 16 members. The members of the Board are a mix of practical experience in standards setting process, or as a user, or accounting, academia or from the preparer community. The Trustees appoint the members of the Board. The present distribution of the Board is 6 members from Europe (although the constitution provides for 4), 4 Members from Asia Oceanic (the constitution provides for 4 members from Asia Oceanic), 3 members from North America (although the constitution provides for 4), 1 from South Africa (the constitution provides for 1 member from Africa) and 1 from Brazil (the constitution provides for 1 member from Latin America). That takes the tally to 15 members. The constitution also makes it amply clear that the work of the IASB will not be invalidated by its failure at any time not to have representation in accordance with the geographical allocation laid down in the constitution. Members of the IASB are appointed for a term of up to 5 years, renewable once. Mr. Prabhakar Kalavarcherla is a member of the ICAI so can be said to represent India. 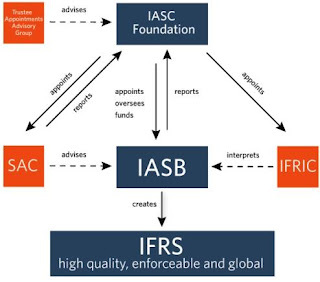 At the time the IASC Foundation was constituted first, the IASB adopted all IAS issued by the erstwhile IASC. The existing IAS continues to be operative till the extent it has not been amended or withdrawn by the IASB. New standards issued by the IASB are called the IFRS. Collectively IFRS includes both IAS and IFRS. The interpretative body of the IASC Foundation is IFRIC. It is responsible for developing guidance on the interpretations of the application of both the IAS and IFRS. Such guidance on interpretation would be on financial reporting issues not specifically dealt with in the IAS and IFRS. It would also be on those issues where there are conflicting or divergent interpretations in the absence of an authoritative guidance. IFRIC comprises of 14 members appointed by the Trustees for a renewable period of three years. No specific geographical allocations have been spelt out in the constitution. Going by the profile of the existing members that comprise the IFRIC it is apparent that the committee does not have representations from India. The constitution provides that the Trustees, as they deem necessary, appoint non voting observers representatives of the regulatory authorities who shall have the right to attend and speak at the meeting. Accordingly, IOSCO (International Organization of Securities Commission) and European Commission are presently the Observers. The members of the SAC are appointed by the Trustees. The objective of the SAC is to advice the IASB on agenda decisions and priorities. The constitution provides that the council may comprise of 30 or more members. No geographical allocations have been specified. Members appointed on the council would represent a wide group of organizations and individuals who are affected by or with an interest in international financial reporting. With so many organizations, institutions, individuals, countries that are participating in this exercise of creating an Organization that will eventually issue Reporting Standards that will be adopted globally, it remains to be seen how the various committees, councils, trustees steer away from the political pushes / compulsions to have a high quality standards drafted and issued. The IASC Foundation has a Conflict of Interest Policy in place but the same was not available on their website for download and for me to include it here. India has to increase its participation in the entire process to ensure that its interest is addressed appropriately. The book is available in Mumbai at Sertling Book Depot in Fort.